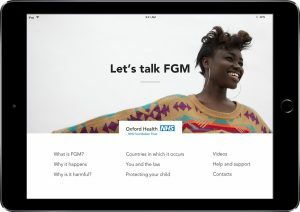 Lets Talk FGM is an Oxford Health iPad app and website designed to facilitate discussions about female genital mutilation (FGM) between health professionals and the people they serve. The app was designed by Joanne McEwan, a public health nurse who regularly came across FGM survivors during her work as a health visitor in Oxford. Joanne won funding for the project via the Mary Seacole Leadership award, and she worked with the campaign group Oxford Against Cutting, as well as Oxford Health and Oxford University Hospitals NHS Trust, to put together the app’s content. The app has been developed by the Oxford-based digital agency White October, and it includes soundbites of key information in five languages about the impact of FGM, why it happens, the law and how to protect children, as well as providing local support for survivors. The app also includes video interviews with FGM survivors, campaigners and health professionals who support FGM survivors. Download the app, see the website or email letstalkfgm@oxfordhealth.nhs.uk if you have any problems using the app. Find out more about the app’s testing, how and why it was developed and award win.